In honor of the Fatima Centennial, here is a hymn from our parish’s May Procession booklet: Our Lady of Fatima. The hymn tune is called “In Fatima’s Cove”, but I was unable to find who composed it. The original Fatima poem used with this melody was in Portuguese by António Botto (1892-1959). Here is another English version, which I decided against because the wording is a little awkward. But feel free to find verses you like and add them to your family hymnal. The verses you find here are from the May Procession booklet I mentioned, and again, I couldn’t find their author. I’ll update this post if/when I do. Hail Mary, Our Mother, Our Lady of Light. From Jesus and Mary, in heresy’s way. And comfort the dying, thou hope of the grave. We’ll seek thee our Mother, nor seek thee in vain. As children of Mary, oh teach us to die. 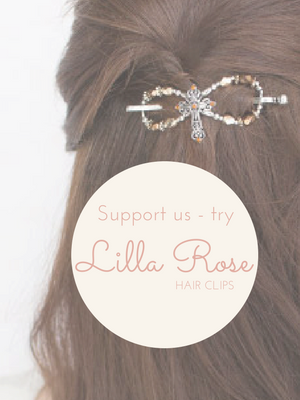 These beautiful hair clips are available during May. Gorgeous!